It’s been a strange week. Last Sunday I posted about feeling low, and wanting to run away and hide, like Elijah, needing the angels to come and sustain me. Bob was going over to Cornerstones – to deliver some bits and pieces, and also to spend time quietly away from distractions, studying and praying. From here on, it is wall-to-wall Advent/Christmas related events and he knew he needed time to prepare himself, and be quiet, and listen to God. While he was gone, I just got on with life, and surprised myself by how much was achieved. Unexpectedly, I suddenly received loads of emails from Connexion members in Dorset, encouraging me, and saying they were looking forward to me joining the group down there. That was so lovely [practical messages too, about find work as a Supply Teacher etc] Having been really upset about losing my camera – I found it again, and found a cheque, and one or two other things I had temporarily misplaced. All of that cheered me up too. And all my teaching went well – and colleagues have been very supportive. These things all seemed to be blessings and sustenance from the angels! But I am very conscious that it is only a couple of months till we move – especially when people keep saying ‘when do you go?’ ‘this will be your last Christmas here’ etc. It would be easy to feel guilty about things I have not done here in Kirby Muxloe, or sadness for the friends I am leaving [will I find such good colleagues in the staffrooms in future?] or feel anxiety about the move to Ferndown [how long will it take to find work?] Such thoughts are not profitable! not to be worrying about what may be. Help me to accept the fact that I cannot undo the past and cannot foresee the future. that I can never drift beyond your love and care. plus a load of brown fabric to go into school to make camel humps and bodies [the heads were in the cupboard, but without the rest of the costumes] The elf tunics helped use up lots of the felt stash. I am seriously reconsidering my decision to make the sewing machines and the kettle the last things to pack. If I packed the machines now, then I can justifiably refuse any more requests for stitching can’t I? The death has been announced of P D [Phyllis] James at the age of 94. I’ve loved her books for over 40 years - a truly gifted writer. A brave woman, who brought up her children alone after her husband returned traumatised from WW2 – and carved out a career as a Health Service Administrator – whilst writing novels as a sideline, she was a woman I greatly respected. Her Adam Dalgliesh [portrayed on screen by Roy Marsden and then Martin Shaw] was an intelligent, but lonely detective, the forerunner to Dexter’s Endeavour Morse. You only have to read the genuine tributes from other authors [Rendell, Rankin, Cornwell et al] to realise how much this woman was loved and respected by them. She was a woman of great faith, and a member of the Church Of England Prayerbook Society. She loved the English language – and her books are carefully crafted. I remember reading an interview in a magazine years ago, where she said that she’d made a lot of money from one book, and said to Ruth Rendell “What on earth shall I do with it? “ and RR said “Get yourself a decent bed”. So she ordered a new bed- with a hand carved wooden frame, an evangelist carved at each corner, and around the sides, was carved the words of the old prayer– “Matthew, Mark, Luke and John, bless the bed that I lie on”. She explained that it seemed somehow fitting to her, as she ended each day with prayer, to have these things on the bedstead. I think that I should love a bed like that too. RIP too, to another nonagenarian, my Uncle Les, who also died this week – Mum’s one remaining brother. He spent much of the war here in Leicester, preparing for overseas service in the desert or in Norway – neither happened! Found it! I am so pleased to report that I have found the missing camera [I dropped a sock down the back of my Shoe Ottoman. I moved the ottoman- and there it was] So now I can post pictures of the WWDP residential. One evening was designated for Maggie and myself to give a presentation about our Salzburg trip, and two others spoke about their Berlin Conference. We also wanted to acknowledge that for two of our group it was their last Residential. As we were spending most of the week looking at stuff from Cuba, we sang a Carmen Miranda Song [Aye, aye, aye, aye, aye we love you very much] with altered words. Here’s me in full CM mode, with fruity headdress. After that, we acknowledged the impending departure of our C of E rep, by being “Justin’s Angels” and singing her a song to the tune of Gilbert and Sullivan’s “Modern Major General”. Thank you to Maggie for this picture. The rest of our week was hard work, and serious preparation. But it was good to let our hair down for just a little while. I was very pleased to report it took just 45 seconds to change from one outfit to the other [It’s the same shirt, and I just pulled off the skirt and and beads, and changed hat and shoes] Maybe I could change career and go on the stage? Now that really is an amazing bit of dressing-up! It is a brilliant film - one of my all time favourites- it reduces me to tears every time. 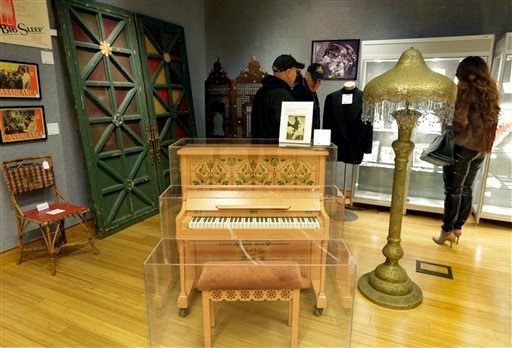 But $3.4 million for the piano seems rather a lot of money, don't you think? During Holiday Club, Abi our Youth Worker encouraged the Teenagers in Task Force to make gifts for the children. They created these little plaques from jigsaw puzzle pieces. After the Club, Abi presented me with a huge bag of leftover bits of jigsaw. They were all painted red. I put them in my Stash. Then recently, a friend asked me for ideas for a Children’s Craft Table she had to organise. I remembered something I’d seen online somewhere. It is so very satisfying to declutter a huge bag of craft bits, and solve somebody else’s problem at the same time. If you want to read my previous Top Tips, then click on the relevant label in the sidebar. If you have any good tips of your own please share them with us! It is one of the great benefits of the internet, that we can share profound thoughts, and useful ideas, and learn so much from each other. Yes, some things do get repeated year on year – but it doesn’t matter. Someone might be reading it for the first time, someone might have a new take on an old theme, someone might have seen it before but forgotten the details. Share it anyway – you never know who is going to be blessed by it. I know it isn't even Advent yet - but I think this is just great! from 1 Kings chapter 19 …When Elijah saw how things were, he went into the desert. He came to a lone broom bush and collapsed in its shade, wanting in the worst way to be done with it all—to just die: “Enough of this, God! Take my life—I’m ready to join my ancestors in the grave!” Exhausted, he fell asleep under the lone broom bush. Suddenly an angel shook him awake and said, “Get up and eat!” He looked around and, to his surprise, right by his head were a loaf of bread baked on some coals and a jug of water. He ate the meal and went back to sleep. The last couple of days have been…complicated. Lots of little things – misplaced, or broken, or plans gone awry – whatever I touch seems to fall apart. Please do not worry about me - nothing major has gone wrong, no crises of faith, major family disasters, doubts about moving, or anything like that. And certainly I have not felt any Jezebels at my heels, baying for my blood. But like Elijah, I just want to crawl under a bush duvet or into a cave warm bed and sleep a little, and wait for the angels to bring me sustenance for the 40 days ahead – and then strength for all that the New Year will bring. It is our Scouts Rummage Sale this afternoon. Over the past few years, we have made some useful purchases here. This year I may not be going. The temptation to buy must be overcome- I must not add to the stuff which must be packed for moving in January. We can offload some of our unwanted Stuff, said Bob. So I will be taking a box of goodies down to the Village Hall this morning -books, ornaments and other bits and pieces which may be of use to others. When we lived in London, our house was on the main road, but on the corner of a close, and all the residents there were senior citizens. The day we moved out [August 1995] one of the little old ladies came up and spoke to me “Are you leaving, dear?” I explained we were off to the Midlands. She returned a little later in the day with this cache pot. “I have to give you a parting gift, to remind you of us” she said. She said how lovely it was that whenever I walked past with my little girls we always smiled and seemed so happy, and we had been such lovely neighbours. I did not even know her name – in fact, I could not remember ever speaking to her before! I wish I had been a ‘lovely neighbour’ to her – and not just someone who smiled as she rushed by with the girls, en route to school [maybe I had said ‘Good Morning!’ occasionally, I don’t know] but she clearly felt we had a relationship, and it mattered to her far more than it did to me. I suspect she went out specially and bought the pot for me –but I do not like it and have not used it in nearly 20 years. I have just looked at it collecting dust on the shelf in the garage, and wondered what happened to that generous lady. I know most of my neighbours in this road,I shall miss them when we load all our stuff into the removal van and set off down south. But the cachepot is not going with us. I am determined to declutter. I am also determined to make sure that when I get to our next home, I will work hard to get to know the neighbours properly, and promptly, and learn their names. It may take time and effort, but like our village Boy Scouts, I will Be Prepared! 10am UPDATE. Just returned from Village Hall with two huge boxes of stuff. The Sale is NEXT Week – my dearly beloved had the wrong date!! This was for our annual WWDP Planning Conference. The National committee meets every November to sort out the service and materials for the Day of Prayer which will happen 16 months later. So this year we were focussing on Cuba 2016. The house was, for many years, the home of Richard Cobden, the champion of Free Trade, and prime mover in the repeal of the Corn Laws back in Victorian England [he was also a passionate campaigner for peace] I admit that I have forgotten most of the stuff I learned about him in school – but I remember Mr Watson., our history teacher, telling us that Cobden cared about poor and hungry people. Good man! Dunford House shares many of his values – fairly traded products are used, and local businesses supported where possible. When we split up into small working groups, I was in the library, where a signed letter from Garibaldi** was in a frame on the mantel. The nearby ‘solarium’ was designed by Joseph Paxton [creator of the Crystal Palace] and it was Cobden whose vision of Free Trade was the inspiration for the Great Exhibition. The house was full of beautiful furniture and historical artefacts, fascinating framed letters, Punch cartoons and posters. In the corridor by my bedroom was an elderly treadle Singer Sewing machine. Lovely! So many intriguing things to appreciate – and I kept forgetting to photograph them – sorry! It was a real privilege to spend time in such a great property with a wonderful history. These photos are from the House website – clearly taken earlier in the year - this week the trees have displayed the most beautiful autumnal foliage. If you ever get the opportunity to visit Dunford I hope you will enjoy it too. **I do like his biscuits, especially with a cup of tea! Are They Pulling The Wool Over Our Eyes? Am I being dense here? I do not understand why it is that Anthropologie are selling “Felted gift ribbon” at the amazing price of £8 for 205cm [that’s £4 a metre] and say that it will ‘lend a uniquely rustic touch to your gifts’ It is just wool. Meanwhile John Lewis are selling Sirdar Big Softee Yarn for £3.50 for 45 metres [that’s less than 8p a metre] It is also wool.If you want to tie up your Christmas gifts with wool, why on earth would you buy the one that costs fifty times as much? Do they think we are stupid? Today is World Toilet Day. Click on the graphic. BBC photographs here. Watch the short film for children, The Adventures of Super Toilet here. If you have access to decent sanitation, be grateful – spare a thought [and spend a penny?] for those who don’t. Hope this charity is feeling flushed with success today! The first time, I made it to Ms Lawson’s original recipe. This does require that you cook the clementines for a couple of hours. Not a recipe to whip up quickly in the evening after work! The second time I halved quantities, and substituted semolina plus almond essence for the more expensive ground almonds. This worked out much cheaper. I also cooked the fruit in the pressure cooker to save time. It tasted fine. This time, I did the full quantity again. But I used half and half almonds and semolina – and I microwaved the fruit [375gm of fruit, pierced all over, in a covered Pyrex bowl with 1tbsp water, cooked on high for 10 minutes] This saved both time and energy. This third incarnation tastes just as good, and I sampled a slice with a spoonful of natural yogurt as dessert before I left home. Do you remember this wonderful comedy? In Norse mythology, it was believed that an acorn placed on a windowsill would guard against lightning strikes. Therefore it became common practice to put a carved acorn on the end of the pull cord on blinds. These things are still called ‘acorns’ even if they are made of plastic or metal, and whatever their shape. Frequently now they are used as light-pulls too. I don’t believe in the superstition that acorns repel lightning and bring good luck to the household, and neither did my Dad. But he had a lovely wooden carved acorn light pull in his home. When he died, I brought it back, and put it on the cord of the light in the downstairs loo. Now I have removed it, polished it up,and intend to put it on the pull cord in the bathroom at Cornerstones. So it will be returning to Norfolk. I just love the feel of the turned wood. I have temporarily replaced it with a couple of wooden beads [notice the cleaner cord too!] I confess that when I took the acorn from Dad’s place 17 years ago, I was in a hurry, and replaced it with a small plastic cotton reel - I wonder if that is still in use? At the moment, I am planning to be very busy with school and Church Christmas events for the next 6 weeks and then will start decluttering and packing in earnest after that. But the process is slowly getting underway – Sarah went home with a mandolin and a recorder, and a friend from school has the rowing machine. One hundred dolly pegs and 100 old CDs have gone into school, to be used as craft resources for ‘Decorations Day’ next week. I intend to give things away as much as I can. Sadly, I have no antiques to sell. The oldest thing round here is me, I think! And all of these stories [apart from the last] are connected with man’s inhumanity to man, and the way that so often profit is put before people, and the poor and the children are the first to suffer. I read recently that Trevor McDonald was [on more than one occasion] found weeping in his dressing room, because he was do distressed by the awful news he was called upon to broadcast. I found that very moving. Graham Kendrick’s wonderful hymn comes to mind. For the children we've rejected, for the lives so deeply scarred? Who can stand before your anger? Who can face your piercing eyes? In an age of cruel rejection, who will build for love a home? Who can sound the depths of mercy in the Father heart of God? Lots of you will have enjoyed the Pause In Advent tradition started by Floss [Troc, Broc & Recup] some years ago. This year, because of other commitments keeping her very busy, Floss isn’t hosting the PinA. However, Alison at View from the Teapot has suggested to another Advent idea you may like to follow up instead. Advent Wonder is a free email twice a week, containing an Advent reflection. However, I’ve been approached by other blogfriends, asking me to host the PinA this time round. Having checked first with Floss, and Alison, I shall indeed be doing this. The idea is that every Sunday during Advent [starting November 30th] you post a thought/ reflection/ whatever about the true meaning of the season. It need not be specifically Christian - just share something to make us pause and step back from the tinsel and trappings, and the crass commercialism which often obscures the real Christmas. If you are interested in taking part, please leave a comment on my blog, and I shall add you to the list on the right. I have found much blessing in reading people’s thoughts in previous years. Do join in if you can. But please don’t feel guilty if you sign up and only manage one or two posts, or they appear in the middle of the week. If you are not up to posting, then just enjoy other bloggers PinA posts, and sign up for #adventwonder to read those inspirational pieces too. Thanks to Floss and Alison for setting the ball rolling on this one! It is Children In Need Day – and at my Wednesday/Thursday School, they are asking everyone to come dressed as a Superhero. So all the my colleagues in Year One [Teachers and Teaching Assistants] will be wearing black teeshirts and leggings today – and superhero capes. Here they are, hanging on my airer over the bath – and below, packed in a box, ready to deliver. In the interests of authenticity, I did try one on and ‘flew’ round the garden with my arm in front of me, à la Superman first. I shall be at my Friday School – I do hope someone takes pictures of them being worn by my friends. I simply folded the fabric in half, and cut semicircles of fabric – using the selvedge edge as the straight side to save hemming. Then [using a saucer] cut out a curve neckline. I overlocked the long curved edge and the neckline, then sewed a ribbon round the neck, with a length at each end to tie in a bow. The logo was cut from red fabric, and then applied to a shield shape cut in a bright rainbow fabric [using Bondaweb]. Then I Bondawebbed it onto the cape, and sewed round the edge [for added security] Job done. it has been said that there are fewer superheroes around now because they can no longer find phone boxes in which to change! Whilst there is no denying that my colleagues are all Wonderwomen, I feel that Lynda Carter’s outfit is somewhat inappropriate for the Phonics Lesson! A simple cape is much easier! This is advice I have never forgotten!! Twenty minutes with some fabric scraps and some Bondaweb, and I have my Spotty Outfit sorted for the Children In Need event at the school where I shall be working all day. And the great thing about Bondaweb is that with the gentle application of a steam iron, I shall be able to peel the circles off again afterwards! I made a superhero cloak for a 5 year old friend too. Amazing what you can do with a strip of old shower curtain! Are you dressing up? What will you be wearing? Are you coming out in spots or being superheroes? It was very moving to see nearly 100 people queuing up quietly and reflectively, waiting to place their poppy prayers around our Castle. Bob’s Your [Great] Uncle & Ang A Great Aunt! Finding Your Way In The Library!